In this tutorial, We will learn implement live email available or not for registration using Ajax Jquery Mysql in Laravel application. This is a most common and very popular feature in most of the web application. While register a new user account then user enters their email address fields then an Ajax call will request send to Laravel controller for check email availability status of the particular email address which user has enter. 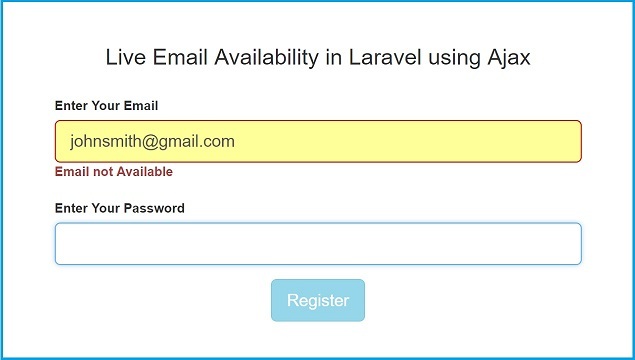 In Laravel Controller it will matches the user email against the mysql database and if email already register then it will return email already register and register button will be disabled and if email available for registration then register button will be enabled. For this first we want to make database connection in going to .env file and config/database.php file. After this we have make one EmailAvailable.php controller by write following command in command prompt. Under this controller we have make index() method for load view file on browser. For this we have write following code. In email_available.php we have define email, password and register html field. And Below this we have write jquery code for check email in proper format and also write Ajax request for check email already available or not in our database. It will send Ajax request to check() method of EmailAvailable controller. For received Ajax request we have go EmailAvailable.php controller and under this we have create check method. This method will check particular email is available or not in mysql database. For this we have use Laravel DB class. Lastly we want to set route for both method of EmailAvailable controller. For this we have to go to routes/web.php file.